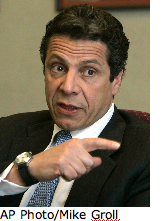 New York Attorney General Raggedy Andy Cuomo has done it again: For the second year in a row, Cuomo sent letters to several banks who received TARP funds, asking that they provide his office with details about their 2009 bonus pools. Cuomo wants to know how many billions of dollars they’re planning to dish out, how they arrived at that number, how much they’re paying in stock versus cash, if there are any clawback provisions included, how this year’s bonus pool differs from last year’s, etc., etc., etc. And Cuomo wants all the digits and details by February 8th, from the following: Bank of America, Bank of New York Mellon, Citigroup, Goldman Sachs, JPMorgan Chase, Morgan Stanley, State Street and Wells Fargo. If you’re curious why Cuomo’s asking these firms for this info (that is, what gives him the right) after they’ve (almost) all paid back their TARP funds, the AG points out in his friendly letter that it’s not clear if these firms would be where they were today (on the brink of paying their employees several billions of dollars in bonuses) without the help of the American taxpayers, a.k.a. the Troubled Asset Relief Fund. The letter comes while several executives at the country’s biggest investment banks wait to hear if they banked seven- or eight-figure bonuses for their efforts last year.